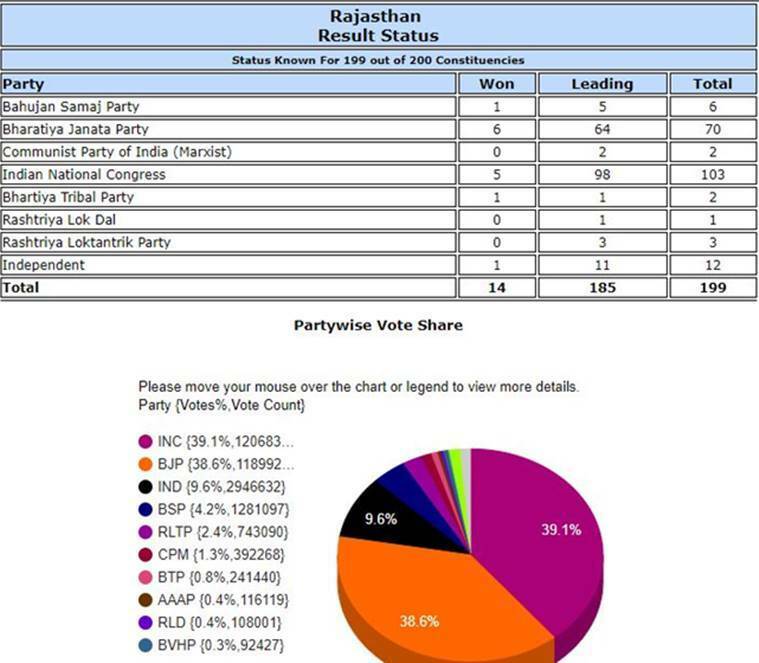 Rajasthan Assembly Election Results 2018: The Congress secured a majority of 99 seats in the state, followed by BJP which won 73 seats. A minimum 101 seats is needed to form a government in the House of 200 in the desert state. Rajasthan Vidhan Sabha Election Results 2018: The final results for Rajasthan Assembly elections were declared late Tuesday night. The Congress secured a majority of 99 seats in the state, followed by BJP which won 73 seats. A minimum 101 seats is needed to form a government in the House of 200 in the desert state. The CPI(M) which drew blank in the last election, won 2 seats in the state this year. Rajasthan Chief Minister Vasundhara Raje on Tuesday night handed over her resignation to Governor Kalyan Singh in Jaipur. Even though the outgoing chief minister who is usually known as ‘Maharani’ won her seat Jhalrapatan with a handsome margin, her party headed for a loss to the Congress. 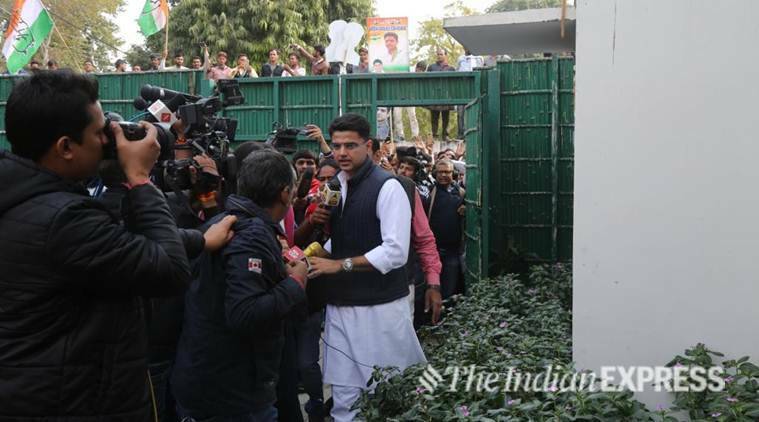 Congress party chief Sachin Pilot Tuesday won from Tonk constituency defeating BJP’s Yoonus Khan by 54,179 votes. Former CM Ashok Gehlot also won in Sardarpura by over 45000 votes. Congress candidates have started celebrating outside Pilot’s and Gehlot’s residences. Former chief minister Ashok Gehlot defeated BJP's Shambhu Singh by over 45,000 votes in Sardarpura. Several rebel Congress candidates who won as Independents in the Rajasthan Assembly polls may help the party to form the next government in the desert state. Though the Rahul Gandhi-led party is surging ahead, it may still need support and a post-poll alliance if it fails to win the mandatory 100 seats, to form the government. As of now, Congress has won 96 seats and is leading on 3 seats, taking its probable tally to 99 out of the 199 seats which went to polls. The Bharatiya Janata Party (BJP) has so far won 71 seats and is leading on two seats, while 11 independents have won and two are leading. Six BSP, two CPM and six other party candidates have also won the elections. According to latest trends, Congress won 85 seats and is leading in 14 constituencies bringing the tally to 99. The Congress needs at least 101 seats to form a government. Rajasthan Chief Minister Vasundhara Raje on Tuesday night handed over her resignation to Governor Kalyan Singh in Jaipur. Addressing a press conference, outgoing Rajasthan Chief Minister Vasundhara Raje thanked everyone for supporting her so far. She also said that she will continue to fight for people and raise people's demand in the Vidhan Sabha. "I would like to congratulate Congress. I accept this mandate by the people. BJP has worked a lot for them in these 5 years, I hope the next party takes those policies and works forward," Raje said. 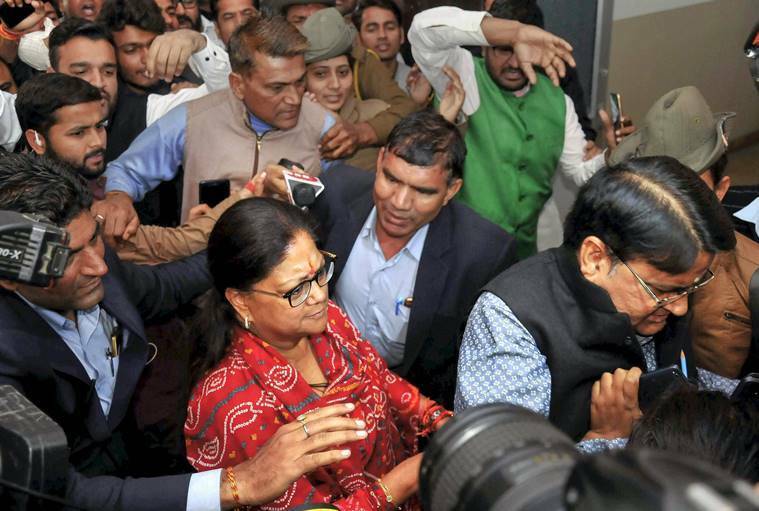 As many as 13 of 19 ministers in the outgoing Vasundhara Raje government have lost the Assembly elections in Rajasthan as results and trends brought electoral reverses for the ruling BJP. Among the ministers who lost the elections are: Agriculture Minister Prabhu Lal Saini (Anta), Food & Civil Supply Minister Baboo Lal Verma (Baran-Atru), Revenue Minister Amra Ram (Pachpadra), Tourism Minister Krishnendra Kaur (Nadbai), Housing and Urban Development Minister Srichand Kriplani (Nimahera). Also among those who lost are Water Resources Minister Rampratap (Hanumangarh), Social Justice Minister Arun Chaturvedi (Civil Lines), Industries Minister Rajpal Singh (Jhotwara), Cooperative Minister Ajay Singh (Degana), Gaupalan Minister Otaram Devasi (Sirohi) and Transport Minister Yoonus Khan (Tonk). PHED Minister Surendra Goyal (Jaitaran) and Devsthan Minister Rajkumar Rinwa (Ratangarh) had turned rebel after the BJP denied them ticket and they contested the elections as Independents. Both have lost their respective seats. Congress leader Rooparam defeated BJP's Sangsingh by a remarkable margin while in Jhunjhunu, Brijendra Singh Ola defeated BJP's Rajendra Singh Bhamboo by over 40,000 votes. In East, BJP's Siddhi Kumari won by over 7,000 votes defeating Congress leader Kanhaiya Lal Jhanwar. In West, BJP's Gopal Krishn lost to Congress leader Bulaki Das Kalia. Adressing a press conference in Delhi, Congress Chief Rahul Gandhi said, " this is a victory of Congress workers, small traders, farmers. This is a big responsibility for Congress party and we will work on this. "We are going to provide these states a vision. We are going to provide these states a govt that they can be proud of," he added. 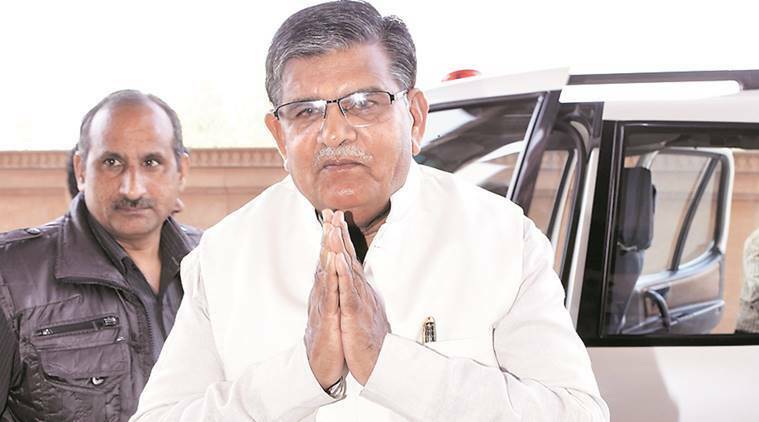 In a major feat, Rajasthan Home Minister Gulab Chand Kataria won for the eighth term on Tuesday. Kataria, 74, defeated Congress's Girija Vyas by 9,307 votes in Udaipur assembly seat. He has held various political portfolios under BJP governments and also served as the party state president. Meanwhile, in Telangana, K Chandrashekhar Rao’s Telangana Rashtra Samithi (TRS) has swept the state. For the BJP, more than losing the election, the fact that these numbers put its dream to enter southern India on hold should be of greater concern. Congress president Rahul Gandhi will take the final call Wednesday on who will be the chief minister in Rajasthan after taking in account the opinion of the newly elected MLAs, a senior party leader said. 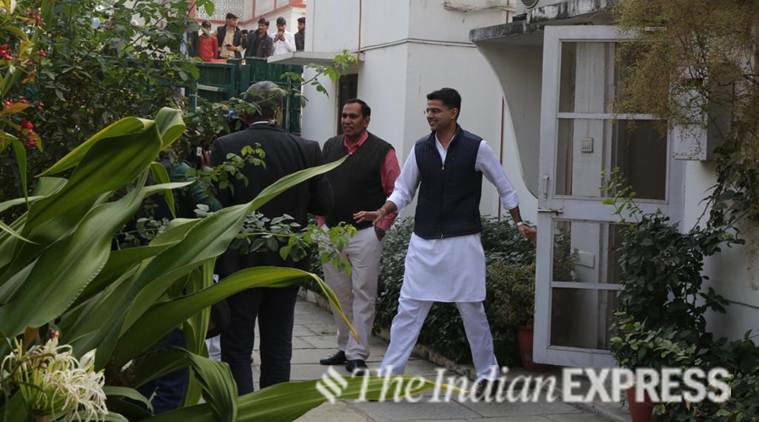 Senior party leader Ashok Gehlot and Pradesh Congress Committee president Sachin Pilot are the contenders for the coveted post. "Congress legislature party (CLP) meeting will be held at 11 am on Wednesday in which the elected MLAs of the party will pass a resolution. The observer will seek individual opinion of the MLAs," AICC general secretary Avinash Pande said. Rajasthan: Ashok Gehlot, Sachin Pilot and Congress leaders in Jaipur. Congress party has won 64 seats in the state and is leading on 34 seats so far. Even though Vasundhara Raje who is usually called 'Maharani' won her seat Jhalrapatan with a handsome margin but her party appeared headed for a loss to the Congress on Tuesday. As results came in and her party's defeat seemed imminent, she visited the BJP headquarters in Delhi but did not make a comment. This was her second term as chief minister and, in keeping with the tradition of voters choosing the Congress and the BJP alternately, the ruling party looks set to lose power. Raje, the daughter of Jivaji Rao Scindia, the last reigning Maharaja of Gwalior, and Vijayaraje Scindia, a prominent BJP leader, ruled Rajasthan as chief minister from 2003-2008 and from 2013-2018 and was leader of opposition from 2008 to 2013. After drawing a blank in the last election in Rajasthan, the CPI(M) is all set to win two seats, both of which were held by the BJP. The Left party's Balwan Poonia is leading with 73,725 votes in Bhadra constituency of Hanumangarh district. His nearest rival is BJP's Sanjeev Kumar. In Shree Dungargarh constituency of Bikaner district, the CPI(M)'s Giridharilal Mahiya is leading with 72,361 votes. In the 2013 elections, the CPI(M) or the Communist Party of India (Marxist) had failed to win any seat. It won three in 2008 elections. The CPI(M)'s Rajasthan in-charge Hannan Mollah said the trend of election results in the three Hindi-heartland states has ended the myth of the BJP's invincibility. 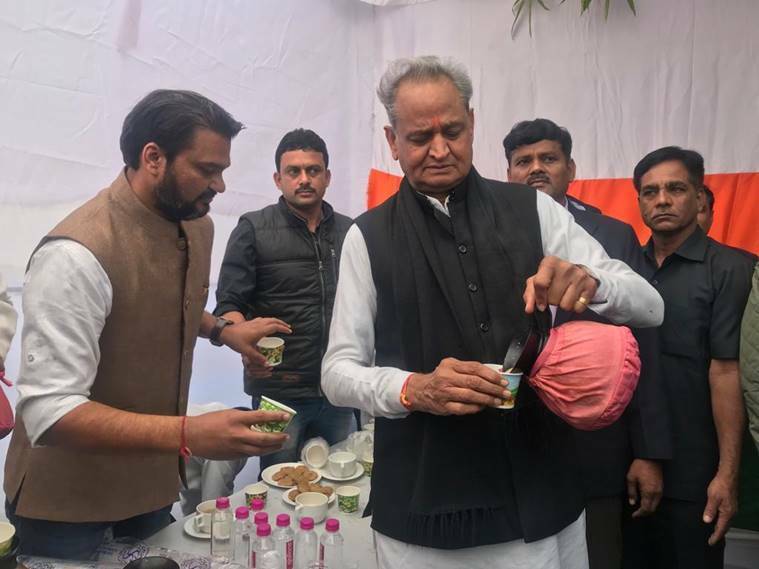 The Congress is likely to go for a post-poll alliance in Rajasthan, where it is approaching towards a majority mark, former chief minister Ashok Gehlot said on Tuesday. Gehlot indicated towards assembling an alliance by taking along willing parties and the candidates who have parted ways with the BJP. 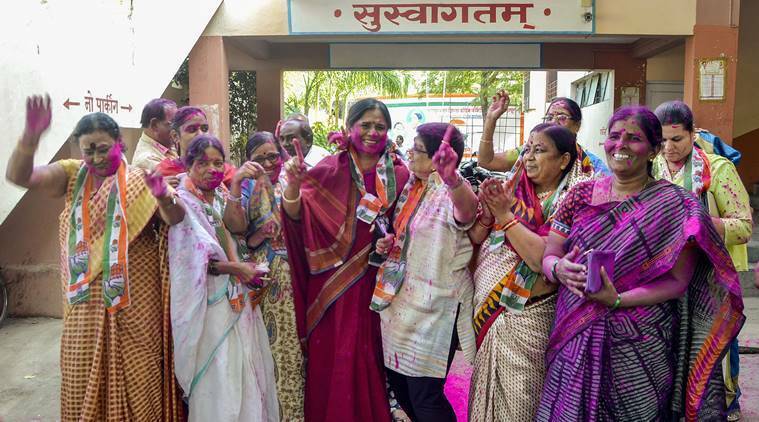 The Congress has contested the assembly elections with a pre-poll alliance on a total of five seats -- Mundawar and Kushalgarh (with Loktantrik Janta Dal (LJD); Bharatpur and Malpura (with Rashtriya Lok Dal (RLD); and Bali (with NCP). 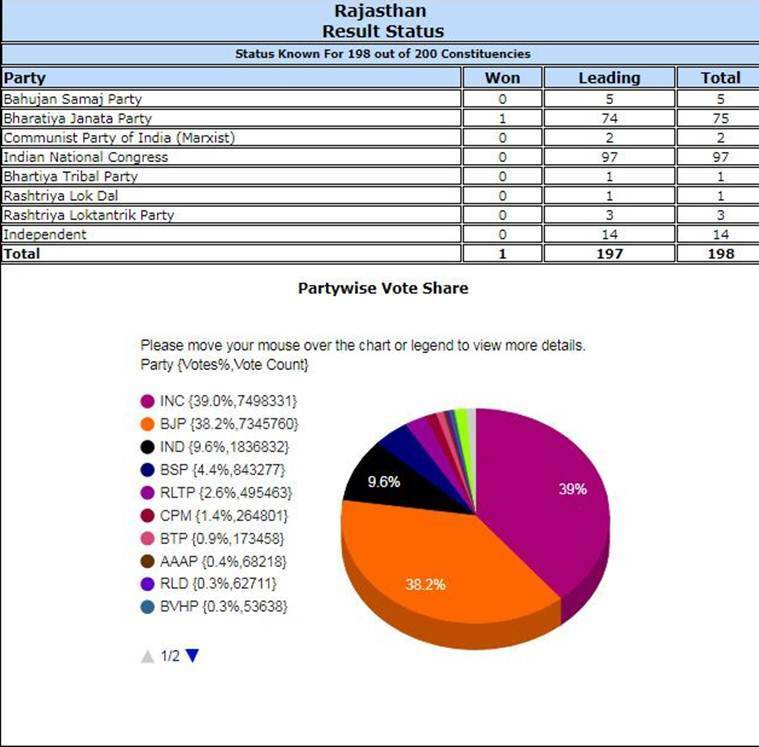 Rajasthan's Water Resources Minister Ram Pratap and BJP leader Rampratap has lost the Hanumangarh seat to Congress candidate Vinod Kumar with a margin of 15,522 votes while Gaupalan Minister Otaram lost the Sirohi seat to independent candidate Sanyam Lodha with a margin of 10,253 votes. Lodha is a Congress rebel. Congress party chief Sachin Pilot Saturday won from Tonk constituency defeating BJP’s Yoonus Khan by 54,179 votes. This is Mr Pilot's first assembly election. He has been a two-time parliamentarian. Congress candidates Johri Lal (Rajgarh-Laxmangarh) and Zahida (Kaman) also won while BJP's Santosh Bawri (Anupgarh), Kaluram (Dug), Samaram (Pindwara), Jagsiram (Reodar) won. With Congress marching towards victory in Rajasthan and Chhattisgarh, the newly elected MLAs will meet in Raipur and Jaipur respectively tommorrow. After 15th round of counting, Former Rajasthan chief minister Ashok Gehlot is leading on Sardarpura constituency with a margin of 37,470. Congress leader Sachin Pilot winning from Tonk constituency by over 50,000 votes. 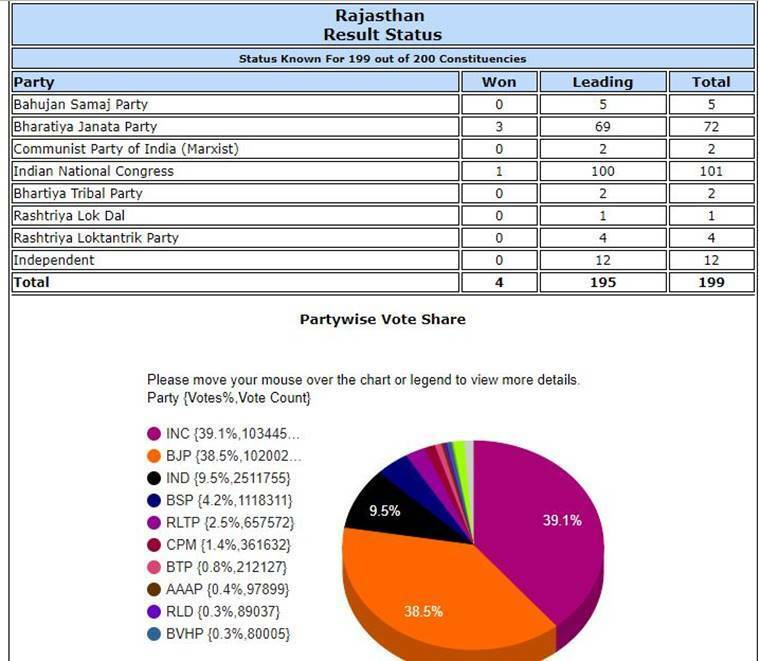 BJP leader Vasundhara Raje is also winning from her Jhalrapatan constituency by over 32,000 votes. Reaching a close majority in Rajasthan, Congress leaders say trends are an indication of things to come. Senior Congress leader Ashok Gehlot said, "We are confident that the Congress will get a clear majority and will form the government in Rajasthan,"
Gehlot also credited Gandhi with the party's good performance in all the five states, saying he raised issues concerning the public on which the BJP and Prime Minister Narendra Modi did not have any answers. As votes were counted, Shiv Sena Tuesday said the outcome of the elections in the five states is a clear message to the BJP and there is a need for the ruling coalition to introspect. Shiv Sena spokesperson and the party's Rajya Sabha lawmaker Sanjay Raut said the trends reflect that the BJP's victory chariot has been halted. "This is a clear message and it is the time for us to introspect," Raut told reporters in Parliament Complex. Who will be the CM of Rajasthan? Asked about who will be the chief minister, Sachin Pilot said Congress chief Rahul Gandhi and the party's MLAs will decide on it. Asserting that it is a decisive day today, Pilot recalled that exactly a year ago Gandhi became the chief of the party. "What could be a better gift to him than victory in these states," Pilot said. Later, Pilot said that while he was confident that the Congress would get a clear majority in Rajasthan, he was in touch will all like-minded parties and Independent candidates who are leading in the trends. 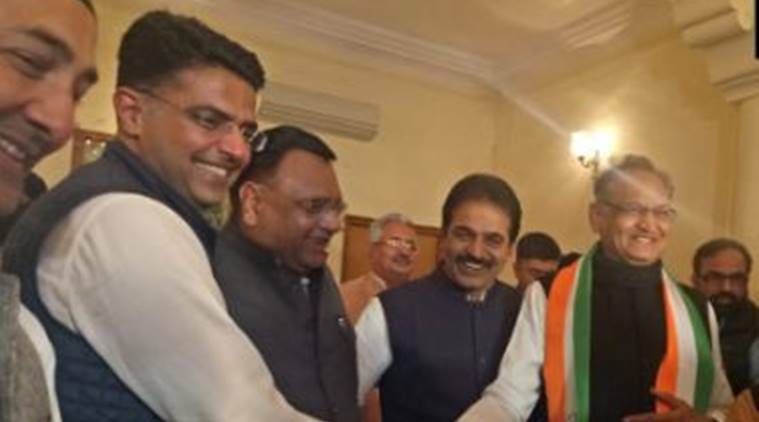 Rajasthan Congress chief Sachin Pilot Tuesday exuded confidence that the party will form the government in the state and Rahul Gandhi as well as the party's MLAs will decide on who will be the chief minister. He said the Congress was marching towards victory in Rajasthan, Chhattisgarh and Madhya Pradesh and the trend would continue in the future in the rest of India. "People have blessed us. We should get a comfortable majority in Rajasthan," Pilot said. 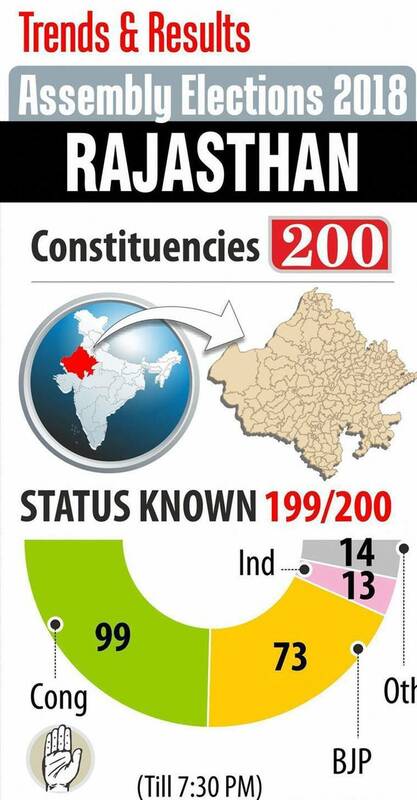 The IndianExpress.com has a LIVE data map of the results coming in from Rajasthan as well as constituency-wise data. Congress President Rahul Gandhi reaches Sonia Gandhi's residence, 10 Janpath. Sachin Pilot says, "We are moving towards a full majority and I am sure it will be clear once final numbers are in, but still we welcome all like-minded and anti-BJP parties to support us and we are in touch." Reacting to election trends, West Bengal Chief Minister Mamata Banerjee Tuesday said the BJP was nowhere in the "semi-final" ahead of the "final match" in 2019 and people were always the "man of the match" in a democracy. "People voted against BJP. This is the people's verdict and victory of the people of this country. Victory of democracy and victory against injustice, atrocities, destruction of institutions, misuse of agencies, no work for poor people, farmers, youth, Dalits, C, ST, OBC, minorities and general caste," she said in a series of tweets. The Congress was leading in the BJP-ruled states of Rajasthan and Chhattisgarh and was locked in a close fight in Madhya Pradesh while the TRS forged ahead in Telangana and the MNF in Mizoram, trends indicated on Tuesday as votes for elections in the five states were counted. Congress leader Ashok Gehlot enjoys a tea at his residence on Tuesday. 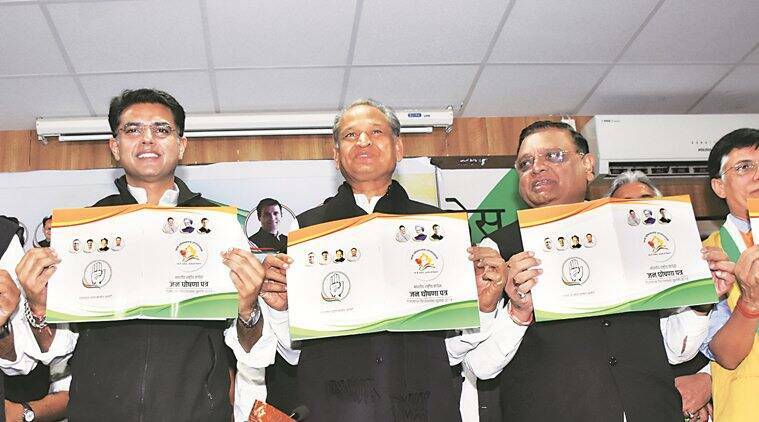 Rajasthan Assembly elections 2018 LIVE results: Congress leaders releasing the party's election manifesto. Rajasthan Assembly elections 2018 LIVE results: Most of the exit polls predicted a comfortable win for Congress in Rajasthan with the grand old party marching towards a majority mark. The BJP is battling strong anti-incumbency in Rajasthan, a state that has not voted the ruling party for a second term in the last 20 years. The elections are crucial for the Congress party as well as it seeks to leave behind a series of defeats since the 2014 Lok Sabha elections when the BJP rose to power at the Centre. If the Congress wins the state polls, as exit polls were predicting on Friday evening, Ashok Gehlot is tipped for the chief minister's post. So is state party chief Sachin Pilot. Before the media on Friday, both sidestepped queries on who among them will end up with the responsibility, but predicted a party victory.